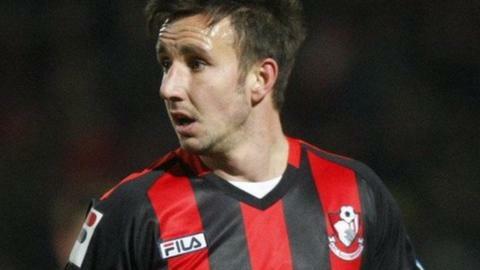 Rotherham boss Steve Evans says the club had agreed a deal with Bournemouth for record signing Matt Tubbs. The striker had been out of favour in the early part of the season, but came off the bench to score on Saturday and netted again on Tuesday. And Evans says because of those two goals the loan deal has fallen through. "We had come to an agreement (with Bournemouth) last Friday but we're not going to get him now," he told BBC Radio Sheffield. Matt Tubbs scored 58 goals in 78 appearances during his spell at Crawley Town from August 2010 to January 2012. He netted 37 times in the league during the 2010-11 season to help Crawley, who were managed at the time by Steve Evans, win the Blue Square Bet Premier title. Tubbs scored a last-minute equaliser against Hartlepool on Saturday and also fired past Brentford in Tuesday's 2-2 draw. They were the £700,000-signing's first two goals of the season, and a welcome boost for the former Crawley striker. "We're back to the drawing board, it's not going to happen," admitted Evans. "I will fall off a tree if they made him available. "It's not to be. Matt came on as a sub and scored a last-minute goal for them, which he's always capable of doing, and scored again on Tuesday. "He did really well and took his chance and what we thought was going to happen now won't after what he did on Tuesday. "It's gone, there is no point in me thinking about Matt Tubbs." Tubbs, 28, had issued the club with an ultimatum after falling down the pecking order at the Goldsands Stadium. And Evans says he may be tempted to go back after the striker, who he managed at Crawley, in January. "It goes without saying that he'd be a big asset to for us because he's a player with a regular habit of sticking the ball in the net," he added. "It might be something we look at again in January if the boy falls out of favour down there. But, although we've put a lot of effort into it, we have to move on."